Unique and totally flexible aeration system. DCA machines are configured to the application and product. Maximum yield, consistent, uninterrupted trouble-free production even when using high fat whipping creams. New auto-clean. All DCA machines are easily cleaned using a unique automated pressurised system, combining low water temperatures and DCA’s specially formulated Sanitiser. Achieving a high standard of hygiene without the need to disassemble component parts. Unique aeration system. Delivers exceptionally high and consistent yield return. Open bowl mixer: 10 litres of liquid cream produces 22 litres of whipped product. 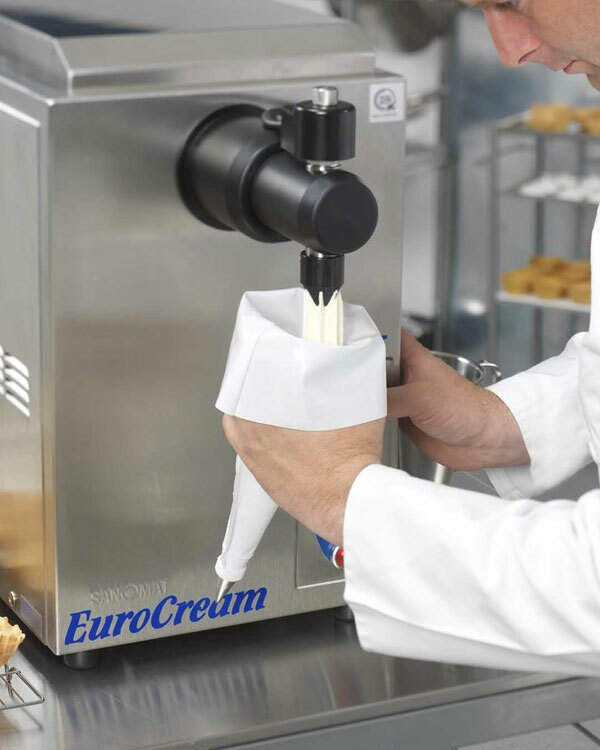 DCA Eurocream: 10 litres of liquid cream produces 28 litres of whipped product. Delivering a saving of 28% in liquid cream expenditure. Fastest throughput for a machine of its kind. Aerating and dispensing 2.8 litres of whipped cream every 38 seconds. Ideal for use in bakeries when filling piping bags or using DCA’s direct piping bag option on busy production lines. Patented refrigeration system. Cooled outlet and dispensing head ensures cream is kept safely cooled throughout the entire machine. High quality insulation. Very low energy usage. No wastage or down time. Improves efficiency and reduces cream costs. A DCA cream whipping machine will meet your requirements for high quality fresh whipped cream. Our range contains models to suit all applications from small retail bakeries to large and continuous production lines. Eurocream and Mini-Bako models are ideal for the UK bakery market. Please call DCA Equipment Ltd on +44 (0) 1299 250466 or complete our contact form.